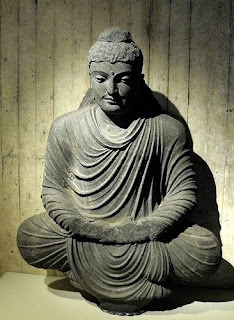 Seated Buddha (Flickr photo),Pakistan or Afghanistan, ancient region of Gandhara. A myth is an idea that, while widely believed, is false. The religious myth is the most powerful device ever created and serves to manipulate and control society. Certain Buddhologists have always doubted that Gautama Buddha was a historical person; there just isn't enough historical evidence to substantiate the claim. Since it's not possible to prove a negative, such as that Buddha never existed, skeptics are willing to concede that he could have been made up from a composite of several ascetics that perhaps flourished in Northwest India around mid-first millennium BCE. From archaeological and other evidence, it's likely that the religion was based on an Indo-Scythian who lived sometime in the 5th to 4th centuries BCE in the Greater Gandhara region, not in the Nepal Terai as is generally believed. The Indian name for Scythians is Saka (or Sakya); hence Buddha is also known as Sakamuni (or Sakyamuni), the sage of the Sakas. When the center of power of the Mauryan empire shifted east, the story of the Buddha—which had been transmitted orally for centuries—was written down and relocated to the Indo-Gangetic plains. But the Sakyans still retained the memory of the sage as one of their own. That is why we find that more—and earlier—sculpture and architecture made in the service of Buddhism has been found in Greater Gandhara than in any other part of ancient South Asia, and the earliest anthropomorphic images of the Buddha show distinctly Aryan features. And that is why the Sakas were most ardent in spreading Buddhism along the silk road into Central Asia, eventually to invigorate the air of China and Japan. 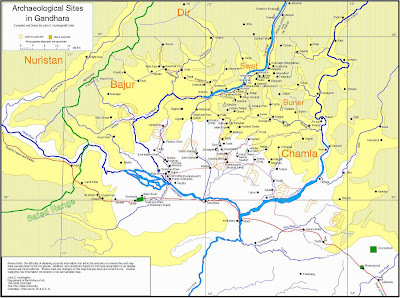 Map of Gandhara, (compiled and drawn by John C. Huntington, 1989, The Ohio State University), showing high density of Buddhist sites. Click to enlarge. 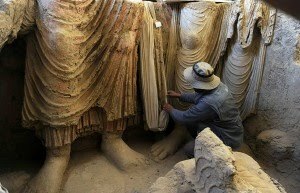 Buddha statues at Mes Aynak, Afghanistan. It could never happen in Nepal or North India in a thousand years because these lands were never the real homeland of Buddhism. E. Senart was a late 19th century Buddhologist who leaned towards the idea that Buddha was a mythological creation, but for practical purposes he's willing to give Buddha the benefit of the doubt and concede he may have been historical. He claims that either the historical data are the primary nucleus of the story while the legendary elements represent an ulterior action, or inversely, the mythological traits form a connected whole which is grafted on the historical data, if there really are any. He claims that it is the first point of view that has been held up to the present time and he seeks to show that we ought decidedly to substitute the second. Here's a quote from his essay, E. Senart, Essai sur la légende de Buddha, 2e édit. 1882, pp. xi-xii. "A sect has a founder, Buddhism like every other. I do not pretend to demonstrate that Sakyamuni never existed. The question is perfectly distinct from the object of this treatise, It follows, certainly, from the foregoing researches that hitherto the sacred personage has been given too much historical consistence, that the tissue of fables grouped around his name has been too facilely transformed, by arbitrary piecings, into a species of more or less unplausible history. Skepticism acquires from our analyses, in some regards, a greater precision: still, it does not follow that we should indefinitely extend its limits. In this epic and dogmatic biography, indeed, there remain very few elements which sustain a close examination; but to say this is not to say that among them there has not entered some authentic reminiscence. The distinction is certainly very difficult. Where we are not in a position to show for a tradition its exact counterpart in other cycles, a decision is an extremely delicate process. All that is suspicious ought not necessarily to be eliminated: it is right that whatever is rigorously admissible ought to be retained. There is no alleged deity—not Vishnu, or Krishna, or Heracles—for whom we might not construct a sufficiently reasonable biography by proceeding as has hitherto been done in regard to the legend of Buddha. A clip from The God Who Wasn't There. Shows Jesus Christ was a myth and how religions can be founded on a lies. "Under these reserves, I willingly recognize that there remain a certain number of elements which we have no absolute reason for thinking apocryphal: they may represent real historical reminiscences: to that, for my part, I have no objection. It is possible that the founder of Buddhism may have come from a tribe of Sakyas, though the pretended history of that race is certainly quite fictitious. It is possible that he may have come of a royal line, that he may have been born in a city called Kapilavastu, though this name arouses grave suspicions, opening the door to either mythological or allegorical interpretations, and the existence of such a town is very feebly certified. The name Gotama is certainly historic and well-known, but it is a borrowed name which tells us little. Much trouble has been taken to explain how this strictly Brahmanic patronymic might have passed to a family of Kshatriyas, [the warrior caste] . Apart from Buddha, it is above all closely associated with his supposed aunt, the legendary Prajápati... . I do not speak of his genealogy: it has certainly no value, being borrowed whole from epic heroes, in particular from Rama. On the other hand, it may well be that the teacher of the Buddhists entered on his religious career at the age of thirty-nine ..... ."
Dr. Ranajit Pal has pointed out that many famous cities in modern India had older counterparts in Iran-Baluchistan, which were parts of ancient Greater India, and that Sir William Jones' contention that Patna in eastern India was Megasthenes' Palibothra, (Pataliputra), was a fatal error that has no archaeological basis. Dr. Pal claims that Jones' view that the crucial state of Magadha was Bihar is also baseless. The first epigraphic mention of Magadha is an Asokan edict in faraway Bairat, and there is no evidence for an ancient Magadha in Bihar. Magan, in west-Baluchistan, must have been the early Magadha, he says. "Its detailed knowledge of Northwestern India, and its pejorative attitude to other parts of India, particularly the South and the East, suggest that it was written in the Northwest; on the other hand, its reference to Pataliputra alone among cities suggests that it may have been written in Pataliputra (near the present city of Patna, in Bihar, as Yashodhara (who wrote the definitive commentary on this text, in the thirteenth century) believes to be the case." Does that make sense? Doniger says the Kamasutra speaks pejoratively about the South and the East, and was thus probably written in the Northwest. But the only reference to a city is of Pataliputra, which, because of Cunningham, she (and practically everyone else) believes to have been in Bihar, in the East. Doesn't it make more sense that Pataliputra was in the Northwest, as the Kamasutra and Yashodhara in the thirteenth century clearly assumed? Dr. Pal has also pointed out that had the Buddhist canon been formulated at Gaya, Varanasi or Nalanda we would have had ancient manuscripts from these places. But the oldest documents come from Gandhara. This cannot be accidental, he says. Anyway, I'm running ahead of myself; just wanted to give credit to Dr. Pal for being first with the idea that Buddha was not from the Nepal Terai, but from Seistan, or Gandhara. His website: A New Non-Jonesian History of the World. I have drawn on the contributions made by earlier scholars and researchers in support of my conclusions; where I have done so, I have cited the sources. Of course the opinions expressed or conclusions reached here are tentative. In fact, I shall be satisfied if they are regarded as worthy of serious consideration and lead to discussion. I like your skepticism! I believe there are a few problems with your thesis. The Buddhist texts explain an interaction between the Sakae and the Brahmins. The Sakae were not all Kshatriyas, and, even so many were, they payed reverence to Brahmanas by addressing them as BHO and even vice versa.All evidence, also with the Jains, suggests Alexander was not the cosmopolitan and in many early Buddhist art of North India and Central Asia shows obvious racial interactions. Although the earliest Buddhist fragments are in the Kharosthi script from Afghanistan, among these we have fragments of Mahayana works thought to be of later date, but also the Theravada had strong roots in this area held by ALexander and later Indo-Greek kings. The earliest writing in India is Asoka's edicts and also the earliest Sanskrit texts are Buddhist (though in a Sanskrit mixed with a particular Prakrit). To challenge a historical Buddha we should ask why the sutras and suttas are so extravagant in that the whole workd bends to the Buddha, even while attacked he dodges bullets as if he stood outside of time, etc. In support of a historical Siddhartha Gotama is how large and standard was the early Buddhist oral tradition; if we take the legends before the time of Kanishka to be a biography, the Buddha-bio was, and is, the largest biography in the world and supposing a group of reformers could have constructed such a massive myth in which characters, locations, general narrative, customs and mannerisms, were in such agreement seems unlikely. The Sakyas were not all Kshatriyas, obviously; but you never hear of any of them being Brahmins. They may have respected the Brahmins, after all they had been in India for centuries by now. Then there's the famous case of Ambattha visiting them and finding them foreign, fierce, violent, rough-spoken wanderers. The challenge to Buddha's historicity comes from the fact that we know nothing of his life except that of made-up legend, from his birth and family circumstances, and so on. Most Buddhologists would agree that the so-called teachings of the Buddha were put into his mouth centuries after his death, had he ever existed. because science is biggest slavery in the history of Mankind. Religions does not equal to Buddha/Gods. It's an interesting idea that, say, the Buddha never existed. One point as far as statues or Buddha images being found primarily in the Gandhara region are concerned would be due to the direct request by the Buddha not to have images of himself erected after his death. It was only once Buddhism came into contact with the Greeks that the humanization of the Buddha commenced. Let's explore the idea that the Buddha never existed. Let's pretend that it was a guy named Scott and some bros who got together to play a funny trick on the local gullibles. What would it matter? The point of Buddhism is not that the Buddha was a holy man and that he carries with him some kind of religious authority but that of the teaching itself. As far as the teaching goes, it's a complete system of mental training that does exactly what it was meant to do: Decrease human suffering. The complete Buddhist system of mental training may or may not decrease human suffering, but at the cost of a lot of excess baggage carried in the form of myths and untruths. As a secular humanist living in the 21st century, I think we can do better than that. You can believe what you like; that's the role of religion. I'm interested in the historical angle. Like most major religions still practiced today, except perhaps Hinduism, a real person has been postulated as its founder, when there is no evidence to suppose that that person ever existed. It's as if we study about Alexander the Great, then find out that he was a mythical character. We should then at the very least move him from the realm of history to mythology. I fully agree with you. Buddha is a myth. But what perplexes me is why you argue the case based on opinions and historical myths. There are two classes of spectics:(1) Those who have the humility to say "I don't know"; and (2) those who say "only I know"; all other's don't know. To which class you belong, the first or the second? DCW, thanks for your comment. Of course I belong to the first category: those who have the humility to say "I don't know." But historians, even armchair ones, must be permitted to analyze the evidence and come to some conclusion. That is why I have gathered the opinions of many scholars who have studied Buddhism and concurred that there was no historical Buddha and, in my humble opinion, they are right. If some evidence for the historical Buddha were to emerge, such as it was discovered that one of his bone relics was really human, rather than of a pig or horse, I would be open to further evidence. My position is merely that, up to now, there is no tangible evidence of a historical Buddha. And his life story is the stuff of legend. I wish to congratulate you, good sir, on your blog and your excellent and well-laid out thesis. Not that I agree with all aspects for it, but for years now I've been looking for serious scholarly work questioning the very existence of Buddha and the official historical narrative on the early development of Buddhism - and yours is so far the best (or practically the only) study I've found on topic (sad, really, that this issue is not tackled so much more in serious studies). I must say, however, that it never occurred to me to connect the Buddha or Buddhist narratives with the history of Indo-Scythians, though the connection now seems so obvious, so rich and so important that it is impossible to ignore. In fact, this brought to my mind an interesting parallel, or perhaps triviality, that you might take note off: in history of early Greek philosophy, you have this figure of Anacharsis, a legendary from Scythia, who supposedly visited Greece in the 6th century BC, where he became the founder of the philosophical sect of Cynics. Now the Greek Cynicism, as I'm sure you know, shares in fact many similarities to Buddhism (particulary its early forms), and it is perhaps more than coincidence that the semi-legendary founders of both sects were, at least in antiquity, belived to have some connection with Scythians. Thank you for your comments. In the 19th and early 20th century European and American scholars wrote about the historicity of Buddha, and some were skeptical. Some also wrote about the Scythian connection, so I don't take any credit for the idea. I also wondered about the connection of Greek Cynicism and Buddhism; it could possibly have been brought West by Alexander's army which came into contact with the cynics in the East. Very unlikely, since cynics were known in the West for some time before Alexander. As I said, I think these world-denying, ascetics sects might developed both in India and in Greece due to the influence of Scythian culture from North and Central Asia.